Eric Bailey's Pixinator is a simple tool to aid in identifying dead or stuck pixels in an LCD screen. It was created for those of us who can't stand having a stuck pixel in the middle of our workspace. When buying an LCD screen. You'll want to make sure the screen is as defect-free as possible. When purchasing used, make sure the seller has checked the screen for defects and has an appropriate return policy. When purchasing new, it's best to find a retailer with a no-questions-asked open-box return policy, so that you can return the screen if problems are found. If there is an open-box return fee, it's might be time to compare the cost of returning it with reselling the screen yourself. When selling an LCD screen. Most buyers will want to know whether the screen has any pixel problems, and Pixinator will aid you in fully disclosing the condition of the display. You'll see the greatest return if your screen is defect-free or if the problematic pixels are close to the bottom or right edges of the display, out of most users' workspaces. When problematic pixels develop over time on an LCD screen. Sometimes you can fix the pixel or deal with it. Otherwise, it might be time to sell! When you simply feel like checking up on your screen. If you find your display to be stuck-pixel-free, you'll have the satisfaction of knowing it! There is no surefire way to fix a dead or stuck pixel. Some have had luck gently rubbing the area of the pixel, possibly applying light pressure to both the front and back of the screen. You're mileage may very, and try at your own risk. Alternatively, you could consult the display manufacturer to see if they will replace the screen. Usually, manufacturer's guidelines state that several problematic pixels must be present in a given area before the screen will be replaced. See below for a list of customer relations numbers. Or, you could just deal with it. A dead green pixel in the lower right hand corner of the display - almost invisible in everyday use - is much more manageable than a stuck red pixel in the middle of your preferred Web browsing or typing area, but you might be able to train yourself to ignore both. Some people aren't bothered by problematic pixels. If none of these solutions work for you, as stated above, it might be time to replace the screen. Pixel problems arise from manufacturing defects and can manifest themselves right out of the factory or over time. Each pixel in an LCD screen is composed of Red, Green, and Blue sub-pixels. Any one, or even all of those sub-pixels can short out, either never turning on - a dead pixel, or always staying on - a stuck pixel. Provide your laptop or other device the power it needs while you're "on the go!" 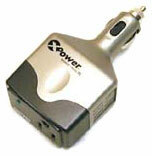 Insert the XPower Mobile Plug 75 into the lighter socket in your vehicle and plug in any electric equipment that draws up to 75 watts (maximum 5 minutes) or 60 watts or less (continuous) AC power. Ideal for using laptops and other electronic devices in mobile applications. The CoolMac Keyboard is the world's most flexible keyboard, in more ways than one. This silicone-cast keyboard is completely rollable and liquid resistant, making it perfect for travel or harsh conditions. Type quietly without the clicking of regular bulky keyboards! USB interface. Ice White. Other World Computing has introduced two new external FireWire CD-RW drives that operate at 52x speeds and allow users to burn CDs in less than 90 seconds. "These new 52-speed CD-RW solutions are further proof of our commitment at Other World Computing to continually bring the best and fastest solutions to market with exceptional value in mind," said Larry O'Connor, president of OWC. "We continue to try and push the technological envelope. We introduced our first 48-speed CD-RWs in November - the Mercury Pro 48x12x48 - and enhanced them in December by pushing the capabilities to 48x24x48. Now we've brought our first two 52-speed CD-RW drives to market. As with all of our Mercury Pro solutions, the Mercury Pro 52x24x52x CD-RW FireWire external solutions offer true 'plug & play' technology and make CD creation easier than ever." The new 52x-speed Mercury Pro drives are compatible with both Macintosh and Windows-based systems with FireWire or USB support, and feature Lite-On SMART-BURN technology. Each drive ships with 25 pieces of CD-R media, one piece of CD-RW media, Roxio Toast Lite 5.2.x and all connecting cables. The Mercury Pro 52X CD-RWs write to industry standard 550 MB (63 min. ), 650 MB (74 min.) and 700 MB (80 min.) discs, respectively, and are capable of over-burn writes of up to 99 minutes. This functionality gives users the ability to manage large back-up jobs, archive data, make music CDs that are playable in any standard CD player, or create, edit and rewrite a variety of data formats to the discs many times over. The Mercury Pro 52X CD-RW FireWire external solution is available now for $159.99 (USD). The FireWire/USB 2.0/1.1 version of the Mercury Pro 52X CD-RW solution is available for $179.99. The Mercury Pro 48x24x48 CD-RW FireWire external solutions are also available at prices starting at $139.99. All three CD-RW solutions are available exclusively through OWC. Willow Design has announced a new line of slipcases for the Titanium, 12", and 14" iBooks. The new slipcases are based on the excellent protection of its previous Macintosh slipcase lines, but add more space for accessories. Users were generally very happy with Willow's past slipcases but often requested the option to carry more. "To meet their needs, we've designed the new line to feature a slightly thicker front pocket for accessories and then added a flat rear pocket which can bellow out to add a couple of inches of space when needed", explains president Nigel Peck. Other features added to the slipcases include a handy externally accessed keychain clip and flap to make home and office commuting easier plus a change or small accessory pocket in the lid which is easily got at while the slipcase is on your shoulder. The Kootenay 15" Titanium slipcase offers a lightweight, compact, yet flexible solution for carrying your 15" PowerBook, power supply and cord, and some accessories. The stylish design offers excellent protection for your Titanium in a compact and expandable case. Pricing: $125 Cdn., $84 U.S. The water-resistant and durable iShuttle iBook Case for the clamshell iBooks comes in five delectable colors: blueberry, tangerine, graphite, lime, and indigo. Holders for pens/pencils, business cards, floppy and Zip disks, and CDs. The Eastern Large Display Case offers a lightweight, compact, highly protective solution for carrying the many of the large screen laptops plus accessories. The case offers superb protection for all your gear with separate compartments for accessories in the lower level and extra space in the front zippered pocket. fits many of the large display laptops such as the 14" iBook. excellent protection for your laptop afforded by 1.2 cm (0.5") foam, reinforced by corrugated plastic on the front, back and lid plus 4 mm (1/8") hardboard on the case bottom. 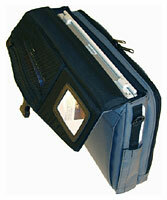 extra protection afforded by cross directional corrugated plastic internal separation dividers. up to four separate compartments for your laptop, adapter and accessories. disc and CD-ROM pockets on the laptop compartment lid. an outer front pocket organizer panel for pens, pencils, checkbook etc. a zippered external front and back pocket which will fit 2.0 cm (0.8") of letter sized file folders or other gear each. a zippered flat front paper pocket. luggage feet riveted through the hardboard bottom of the case which actually keep it up and off the ground. secure thickly padded briefcase style handle with web anchors quadruple stitched and additionally reinforced by quadruple rivets through high density polyethylene underneath the fabric top panel. contoured, thickly padded shoulder strap with heavy duty snap hooks for secure carrying. Price: $124 Cdn, $83 U.S. The side bag offers 3 inside pockets, pen holders and a separate zippered outside pocket. The inside pockets hold accessories like external FireWire drives such as the ultra portable CD-RW drives from VST. The side bag clips onto iCase12 and is removed as easily as it is mounted. Leave the side bag at home for lighter traveling at any time! To make things even lighter you could detach the side bag, fill it with bare essentials, stick the clips onto the velcroed pads on the back and take off with the side bag alone! The new carrying strap is ergonomically formed, very wide and especially well padded for utmost carrying comfort. 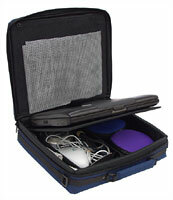 It attaches to the lid of the case to provide balanced load even with a fully packed side bag. The base model iCase12 is equipped with all that it takes to add the carrying strap and the side bag to upgrade to an iCase12Plus in a blink when you find the need for it. These units have plenty of power for word processing, email, the Web, etc. Check email, do your surfing, all from the portable comfort of wherever you want to be. Get it with built-in ethernet, and you've got a Web-ready unit for pocket change!! Machines are refurbished and include a 30 day guarantee. Or, buy an extended one year warranty, exclusive with this machine, for $40 extra. internal ethernet/video card with 1 MB VRAM expansion, $20 with PowerBook purchase. For more deals, see our Best PowerBook G4 Deals and Best iBook Deals.